NDSU's Upper Great Plains Transportation Institute (UGPTI) celebrated transportation in May with activities on campus and outreach to more than 250 elementary schools across North Dakota. NDSU students Jessica Murray and Ali Rahim Taleqani were selected to win gift cards to the NDSU bookstore for displaying "Moving Forward with Transportation" bumper stickers as part of a social media contest sponsored by UGPTI. 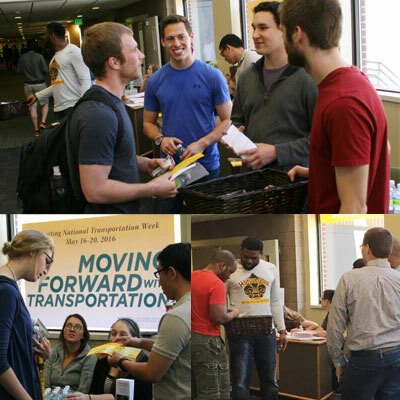 On May 4, transportation and logistics students and student workers in the UGPTI's Department of Transportation Support Center on campus greeted visitors to the NDSU Memorial Union, handing out treats and information during dead week. The information they provided increased awareness of the importance of transportation and prompted discussion about careers and academic opportunities in transportation. NDSU students, faculty and staff who visited the Memorial Union during that time received the bumper stickers. Those who applied the sticker to their cars and posted a photo on Facebook or Twitter were entered into the contest. UGPTI also mailed activity packets to 730 classrooms in more than 250 elementary schools across the state. 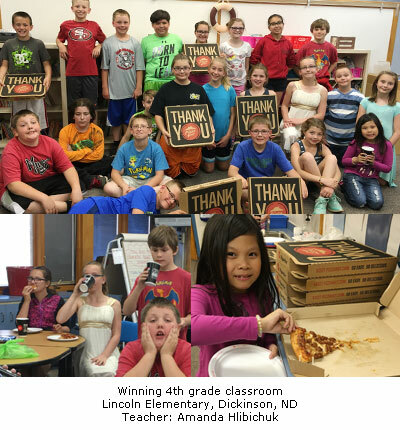 Amanda Hlibichuck's 4th grade classroom at Lincoln Elementary School in Dickinson, ND, won a pizza party for its creativity in using the materials. "Our class celebrated transportation week by drawing transportation pictures. We also built bridges and tested how much weight they would be able to hold, Hlibichuck said. The packet included a proclamation recognizing the importance of transportation from N.D. Governor Jack Dalrymple as well as activity sheets to help students recognize how important transportation is to their lives, their families and their communities. To be eligible for the pizza party contest, teachers submitted photos of their classrooms and students to UGPTI. At NDSU, the Transportation and Logistics Program has been one of the fastest-growing graduate degree programs on campus and currently has 46 master students (all online) and 40 Ph.D. students. The Transportation Institute's Department of Transportation Support Center (DOTSC) design center puts undergraduate and graduate engineering students to work on real-world transportation designs and engineering issues. Teams of students work under the direction of NDDOT engineers to prepare plans, estimates, and studies for real-world transportation projects in North Dakota. Design Center graduates are in demand by the NDDOT, other departments of transportation, engineering consultants, and other employers. Since 1962, Congress has designated the third week of May as National Transportation Week to increase the awareness and appreciation of the transportation industry and to celebrate the transportation professionals who keep our country on the move. NDSU is celebrating transportation earlier in the month in order to do so before students leave for semester break.